Imagine living a healthy, low-stress, disease free life. This is a reality for the many that chose to integrate Crystal Healing Bed into their personal care and health routines. The Crystal Healing Bed was developed by John of God for use at the world renowned healing center The Casa De Dom Inacio in Abadiania, Brazil. They are now available across the world through a select few spiritual practitioners. Crystal Bed Healing is a natural way to achieve rejuvenation, alignment and balancing of our energy fields, which in turn aids in the process of spiritual and physical healing. The Crystal Healing Bed combines the power of Color Therapy and Crystal Healing Therapy. This combined energy stream produces beneficial stimulation on many physical and energetic levels of a persons being. The bed is also a portal for John of God and the Spiritual Guides to more easily assist you. The Crystal Healing Bed was developed by John of God for use at the world renowned healing center The Casa De Dom Inacio in Abadiania, Brazil. The concept was channeled through John of God and was developed for practical use as an important healing modality at the spiritual healing center. It is used for rejuvenation, alignment and balancing of our energy fields, which in turn aids the process of spiritual and physical healing. A Crystal Bed has 7 extremely clear and highly polished Vogel cut quartz crystals suspended approximately 12 inches above the client lying on a massage table. Each of the quartz crystals has been cut to a specific frequency. Each crystal is aligned above one of the seven human energy centers or chakras. 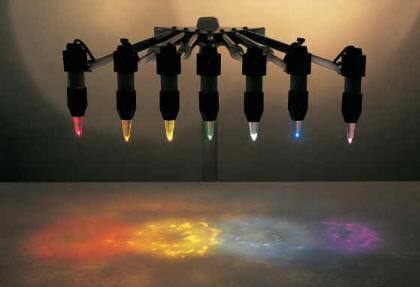 Colored lights, chosen to match the vibrational frequency of the chakra colors, radiate light and energy through the crystals to each respective chakra, (energy centers of the spiritual and physical body) and sine on and off in certain rhythms to cleanse, balance and align your energies. The individual receiving the session rests face up with eyes closed, bathing in energy. In addition to the healing power of the crystals and color therapy that the bed provides, the Healing Spirit Entities of the Casa are able to use this devise as a portal so that they may more easily make their presence felt to those who seek their help in healing. Thus, those using the bed often receive a spiritual healing touch from the Spirit Master Doctors and their spiritual healing staff, Saints or Angles; one sometimes hears or sees inner guidance from them. For the best results, the Entities request you wear white or light colored clothing, simply maintain an attitude of openness, receptivity, and create a clear mind. Remember for all healings 50% is performed spiritually. This requires the additional 50% of your input to finish the healing. Clearing and balancing the spiritual bodies is helpful in all spiritual healing. Take time before your session for at least a quiet reflection of prayer or meditation. It is also helpful, but not essential, that you forma specific intention or prayer of what you want help with. Think of all things for yourself you need assistance with; this is your mental body. Think of all emotions and interactions with others you need assistance with; this is our emotional body. Then think of the healing intentions for your physical DNA body. How is a Crystal Bed Healing Session conducted? Crystal Bed Healing is a safe and non-invasive. The person receiving the Crystal Bed Healing simply removes their shoes, all metal jewelry and crystals, then lies fully clothes on a massage table below the suspended crystals, so that each of the seven crystals aligns to their corresponding chakra. Once the person is comfortable, a white cloth is placed over their eyes, soft music is turned on, and finally the pulsating lights shining through the crystals are turned on. All the individual needs to do is relax, clear the mind of your present life situations, let go, or even fall asleep. The light, the crystals and the Healing Spirit Entities will do the rest. How does the Crystal Bed produce Healing? The “Crystal Bed” combines the power of Color Therapy and Crystal Healing Therapy. This energy stream produces beneficial stimulation on many physical and energetic levels of being. This combination of healing energies is further GREATLY ENHANCED by the “Healing Spirits” of the Casa de Dom Inacio. These Healing Entities are the Spiritual Beings that work in and around the Casa de Dom Inacio and with all those deeply connected to the Casa family. These are also the Entities that are incorporated by the Medium Joao Teixeira de Faria, also known as “John of God.” The colored light shining through the crystals is a tool that the Spiritual Doctors use to channel their healing energy into the individual receiving the Crystal Bed Healing. As the color is transmitted through the crystal onto the corresponding chakra, the chakra is cleansed, energized, and brought into balance with all of the other chakras. This allows the other aspects of our self, whether it be mental, emotional or physical, to be brought into balance. For when the chakras are out of balance, all the other aspects of ourselves will also be out of balance. Then, as these subtle energies are brought into balance, the body’s own natural healing mechanisms are able to function as they was designed to do. The Crystal Bed Healing cleanses, balances and recharges the body’s energy and creates a deep relaxation. It is also a great preventative modality. What to expect after a Crystal Healing Bed Session? As with many Subtle Energy Healing Therapies, the FDA states no claims can be made that any disease states can be cured. However, there are many, many reports of personal healings occurring daily through the world with medical validation. Healing can occur on many different levels, spiritual, mental, emotional, and physical. The Crystal Bed also can help open the connection with the Healing Spirit Guides. It is advisable for the individual to rest when needed and limit heavy physical activity for the next 3-5 days after a “Crystal Bed Healing” Session to fully absorb the experience and allow the body to adjust. It is also advisable to drink several glasses of water over the next 24 hours to help rid the body of any toxins or waste products which tend to be released through the cleansing action of the “Crystal Bed Healing.” It also can be helpful to write down the experiences and guidance which can occur during the healing session, to help integrate and ground the experience into your life. You will receive a written guide to assist you in the spiritual healing steps in the next 3-5 days. This information is from the Spirit Doctors and experiences of the many who have received the healings before you. Remember all spiritual healings require the additional 50% of our intent and energy to finish the healing. How often should Crystal Bed Healing be had? At the Casa, the Healing Spirits often prescribe Crystal Bed therapy. Providing theoriginal Casa Crystal Beds outside of the confines of the Casa – with the specific recommendation and connection with the Healing Doctors – brings the energy and healing vibration of the Casa to you. John of God personally guarantees the energy of the Crystal Beds and thinks of them as his children. In addition, we carefully follow our own guidance from the Spirit Doctors in how we use the Crystal Beds and work with our clients. Because space and time are an illusion, the Spirits are able to be present here and work directly with those who seek their healing and guidance through the Crystal Beds. It is a special privilege for us to be able to serve you in this unique way, where you can receive the energy generated from this powerful healing tool without having to travel to Brazil. We also have two prayer triangles blessed by the Spirit Doctors which further connect your prayers to the Casa St Dom Inacio. Our healing rooms are physically blessed and cleared with essential oils before each session and charged daily with King Solomon, Jesuit and Christian prayers in Hebrew, Latin and English. A cut crystal can be charged with intent to structure water. Since we are made up of 70% water, this carries strong implications for how our body and health can be affected.